Added: Be sure to read Om’s thoughtful response too. Almost every company in the search business (including the one I worked for) started scrambling to find all the other businesses that would make their businesses more than a commodity. We weren’t good at the other businesses and took our eye off the one we were good at. One company dismissed the idea that search was dead: Google. So, to heck with all the people who think Google is out of good ideas. I have tried many different tools to make my work productive. I used Outlook for mail for years, now Gmail. I used Outlook for calendar for years, now use Google calendar. Used to use a different RSS reader (but it wasn’t everywhere), now use Google reader. Used to use Firefox all the time, now I am getting to like Chrome better in some ways. Used to use Mapquest or Yahoo maps. The sites my new company hosts use AdWords and Adsense. All my sites use Analytics and Sitemaps. Google Docs is not there yet, but will be. I use Amazon today for cloud computing, but I am guessing Google will do better (although Amazon’s pretty good, to be fair). Ok, I also moved from Blogger to WordPress, but, well, WP’s better. I use Picasa. YouTube. And that’s just in the last few years. Is it all perfect? Nope. But Google has … “directionality” that I see only from one other company: Apple. It’s hard being on top…in business, that is :-). Does Google really need any more ‘big ideas’? It seems to me they have a lot of big ideas already and they’re now working to turn those ideas into leaders in their respective spaces. I actually find the rate in which Google is shedding these ‘big ideas’ (e.g. – Lively, Dodgeball etc.) to be a sign of a maturing company that has found a greater focus. That’s not to say they won’t have new ideas, but ‘big ideas’ can be a big distractions. There is plenty of ‘big idea’ already left roaming the halls at Google. I think it’s what they do with those big ideas and executing on them to the best of their ability that will be the real measure of success, particularly with the economic outlook for the next 2+ years. Here’s one example that no many folks talk about. Google Books. Once the settlement is blessed by a judge a nearly 5 year effort will come to fruition and Google will be selling digital versions of millions of out-of-print books. THAT is a big idea. It’s just had a long incubation. So you could argue that Google isn’t putting enough ideas in the pipeline. But, frankly, hasn’t Google done an idea land grab for the last 5 years? I think the rate of ‘big ideas’ has slowed and that it *should* slow so that Google can focus on developing and expanding their current stable of ideas. I can understand why Googlers get a bit defensive, when accused of lethargy while so much is going on, but as Tom said, “in 2000 … One company dismissed the idea that search was dead: Google.” – and Google still has its eye on that ball. So long as Google remembers the day job, they can afford to ignore the short-sighted few who haven’t noticed Chrome, off-line Gmail and everything else that’s going on. In most cases, the Google bashers are just jealous, though I’m not making that accusation in this case, as I don’t know the geezer. I agree with AJ Kohn – I think that Google Books is going to be another one of Google’s big ideas, most people just don’t realize it yet. Imagine having that many books and magazines, as well as that much formerly out of print content easily available and searchable online! As avid reader and researcher, I believe it is seriously going to revolutionize the way that we use books and magazines, and that is certainly a big idea. Sorry, gotta agree with Om, or at least the premise. Sure, Google was lucky enough to be in the right place at the right time with the right engine and branding mystique. Generated MASSIVE sums of cash, which allowed it to extol it’s virtue as a place to keep 1999 dot.com charade going. But the bottom line is that every penny of earnings spent on stuff that doesn’t generate an EQUAL or GREATER return on that capital is a waste. Some shareholders might be okay with this, because hey… Google’s cool and if they want to use some of my profits to fund X Prize and reduce the productivity of their workforce by 20% because something really cool might come out of that, well then, I’m down with that. But that’s generally NOT the pact you make with your shareholders. And I suspect right about now, most shareholders would like to reneg that pact. The other tension is that there’s no possible way that Google can ever execute on ALL of the great ideas that are going to spring forth from concentrating that many “smart” people in one place and giving them some time and tools to work on their dreams. GE couldn’t do it. Apple can’t do it. The entire VC community can’t do it, with a very modularized and specialized ecosystem. No one entity is going to be able to bring to market all of that stuff and do it well. So that’s why people have been leaving Google and that’s A Good Thing(tm). Those ideas will find a way to live and breathe, Google be damned, and hopefully they’ll create value and advance the state of the world. But Google will likely not participate in that upside, and neither will their shareholders. So again, we have lost opportunity and in the end, that’s all you should care about if you’ve bought a slice of Google. So having Big Ideas is all well and good, provided two things: you have the capital to fund that time horizon and the bet is worth it (ie significantly more positive ROI than just giving me the money now) AND you have the talent machinery to execute with excellence on every Big Idea. So how much perfection is there? I think Om is a wise person, so I hope I didn’t come across as cranky in debating his point. Paul Bucheit made an interesting point, which is that I lot of the time the Google products need polish and constant small improvements more than huge changes. It’s important to strike the right balance between big ideas vs. execution. Those are nice ideas but not huge ideas. None of them are earth shattering or going to bring about a revolution of how we do things. just builds on an idea or adds to it. What he is really telling you is that now that success has been achieved don’t become complacent. Remember how Yahoo had fallen from grace. And while Cuil bombed, Searchme is doing it much better and one of these days someone will come up with a big idea. Be ready we like you to stay on top. Don’t fade into gray irrelevance like Microsoft has. Speaking of new ideas got me thinking and hope you don’t mind me sharing here. Sometimes I look at my sites’ logs and see what keywords people are using and what pages they land on and think they should have been sent to a different page. It might be nice if webmasters could go through their list of keywords that have sent traffic and suggest in webmaster tools a better page they should have landed on. The one thing that scares me about this though is lets say I have a blog post on my site that has a higher PR than the page that I think the user should have landed on. What if I tell google to send them to the other page instead but then my site doesn’t rank as well for that term as a result? Would I be better off getting more visitors and hoping they continue on to the better page or get less visitors but they all land on the better page. Matt, I don’t subscribe to the theory that Google has no big ideas, in fact the complete opposite. IMO, they implement too many ideas in too short space of time, many of which are still buggy. I would like to see Google release 1 new idea a Month and actually use the Google homepage to promote it, until the next Month/idea. From where I sit, Googles new ideas are often the victim of poor/no marketing and as such, low usage, so the bugs stay around for Years. Matt Cutts, considering your position at Google, maybe you would have more explanations about why google breaks analytics softwares with google ajax search? This is really big deal for analytics software, and the thousands of users that rely on this data to drive their business. I think have not visited Google Labs for a while already. I find many of Google’s innovation useful for a lot of the many things I do. And I will always admire how they keep everything simple. I mean honestly, Without Google Apps, I am toast. I would like to see Google release the GDrive already. There has been rumor and speculation long enough about it I think. It is a market that Google could have led a couple of years ago and now they are playing catch-up with others that have introduced online storage. Online storage seems a natural extension of other services that Google already provides (docs, email, etc). Woops I was talking about Om. I think he has not visited Google Labs lately. I mean last year alone, we got android on a phone. Google Earth 5.0 is more awesome than ever. Google street view remains to be kick A. I mean come on. If those are not good ideas, I dunno what they are. Matt, what http://gmailblog.blogspot.com/2009/02/tasks-paper-vs-iphone.html to do the subject “I think google has no big ideas. this morning they announced a to-do-list. FGS. Remember the milk MUCH better” and why do you care what those with agendas “think”. Akos Horvath, remember that these were just the ideas from the last week. In my experience, we do spend a fair amount of time at Google thinking about blue-sky ways to make the web better. The one thing I don’t understand in this is why ideas have to be “big”. What’s wrong with just adding tweaks or modifying existing “big” ideas to make them better? For example, tying Adsense into Analytics was a great idea. A single login now provides more information than two previous logins did put together. It’s not a “big” idea, but it’s a damn good one. So again…why does it have to be “big” to be impactful? The real problem for Google is that the ante has been upped. Google has had huge ideas in the past, such as adwords/sense, Earth, Gmail and of course their search method. It’s kind of like the Matrix films, in which each film had to have bigger and bigger fight scenes to try and keep the audience more amazed than when they watched the previous films. Neo can take on 3 or 4 guys in the first film, but then he’s got to take on thousands in the 2nd, and then in the third installment he’s got to take on everyone with just his hands, without touching them, while at the same time having his eyes melted and grieving over the loss of his loved one. They’re victims of the expectations created by their success, and I suppose it’s the same with Google. Google does things well, and so people expect huge things from it. Maybe it does still do many things on a large scale, but unless it’s something completely revolutionary and life changing, people will just see it as an version change or such like. Vista was in some ways a bigger change from XP than win95 was to win98… but because Microsoft had upped their own ante, by making XP really rather good, people expected revolution with the next change; instead they were just left with some kind of beta update. Google I’m sure will continue to innovate. The real issue, is that it is unrealistic for people to expect the rate and scale of that innovation to continue to rise exponentially. Good Morning, There is the fishy swimming happy in the little tank.. Referring to the post made by Mr. Om Malik “I think Google has no big ideas. this morning they announced a to-do-list”. I am sure he must be mistaken this time while calculating things together. I mostly use to go through http://www.google.com/corporate/history.html the Corporate History of different milestones Google has achieved. I believe these are all the great ideas that made this Search web a giant in the open market. Matt, me and all other Google Fans have been arround different posts in past just to know what Google is up to. As OM Malik mentioned in his post that google launched some big ideas in this week are new milestones google is moving towards. * Google is funding research on the Singularity. * Google mapping the oceans for Google Maps. * Google’s research into deep web/dark web. * Google tool to measure broadband especially useful now that more and more broadband providers looking to shift to metered broadband model. * Google Android Mobile Operating System. * Google Chrome, a fast web browser with a distinct philosophy of ease-of-use and radically improved security abstractions. Moreover, Google Apps launched in last month which is awesome and i guess like Microsoft Dynamics it is going to become a leader in this domain as well. So what do you think Mr. OM is Google still behind in the market with so many products ? We know that Google came in industry as search engine but there are no limitations for any company or any identity to move on. Though market is suffering from economic crunch but still the ideas Google is working on can become standards in their own respective areas. I do admire what ever the services Google has given to its consumers and i hope this century is going to be of Google. Hats off to Google and its team. mm I think maybe risk assements and better design for dangerous tools like the badware tool which killed google for an hour that system shoud have had some rules to stop dangerous rules like / even being input let alone pushed out to the live environment. @colin MS actulay changed a lot under the hood (audo and networking stacks for two) and messed up they rewrote the tcp/ip stack and introduced bugs that BSD had fixed a long time ago. Matt, all the big ideas aside and get the thing WORKING!!! So far you guys been useless! There are so many good established sites suffering from sudden loss of rankings. They are now in positions like page 4-6 for all their usual listings that were in top 10 for hundreds of keywords! I’m talking about sites that does what you want – best content, all natural, no shady tactics etc, just perfect examples how the content sites should be built. All these years of work suddenly down the drain? Thanks Matt for taking time to answer me. I was just trying to make sure that search stays priority number one and you guys stay on top. Freshness is the key here, and keep your Mo-Jo. Very interesting! This is the first I have heard of Om, but I also don’t read on the internet enough! Great website, thanks for the info. Colin, you have some great points. Colin, so true. Life is all about expectations and perceptions and Google can never live up to everyones expectations. Like going to see a movie that you are expecting to be great v.s. the movie you go to see under durress. The “great” one becomes average and the other one becomes good (better than expected). IMO, Google should focus more on quality of ideas rather than quantity. I think you both have good points, but remember Matt you’re biased which you should be, as an advocate for your company. More importantly lets say you weren’t biased and 100% objective, Om shouldn’t be. Om is a commentator and a subjectivist, an editorialist (but not a sensationalist like so many others). The relevancy of his comments lie less in their objective truth and more in the perception of how thought leaders perceive Google. So the value of his opinion is how accurately it reflects the sentiment of the day and how Google may or may not respond to that, truth aside. Keeping in mind, thought-leaders are just that, and I don’t really think the average Joe and Jane on the street care about “Big Ideas” from Google…. but they may some day. GMail and Google Maps were particularly big “revolutionary” new products for me. GMail changed the way I use email massively, and Google Maps was light years ahead of existing mapping sites. I recently just came across a competitor’s site where he reviews a certain toilet brand and links out to sites selling that toilet. However, if you browse the site, every review points back to one of three sites, which are all owned by the same company. These 4 sites have essentially solidified themselves on page 1 of Google for the brand of toilet in 4 spots. I did some homework by doing a “whois lookup” and in fact the 3 sites on the review site are all owned by the same person. They were smart though, they did a private registration for the review site so I am not 100% sure they own all 4, but we can assume its a good bet. To me this would seem like spam since he owns all 4 sites and the review site is filled with pages upon pages that only point to 3 sites and no others. He even puts banners and such on the site to his 3 sites where he sells the toilets. I have been working hard to go from page 10 to page 2 these past months for this brand of toilet, but if something like this works, can we all do this? Can you please let me know why this isn’t spamming or something along the lines to beat or fool the bots? If it is however spam, how come Google hasn’t picked up on this and banned his sites? …There are so many good established sites suffering from sudden loss of rankings. They are now in positions like page 4-6 for all their usual listings that were in top 10 for hundreds of keywords! Isn’t it amazing how two seemingly different people posted two nearly identical comments focusing solely on the vague and dinosauric notion of sites dropping in rankings as the primary measure of relevance? The only difference between the two is that “Sandy” added a paragraph. From the looks of it, though, Programmer Helper is no stranger to copy and paste, so it’s just as likely the comment was horked. Sites move up/down in the SERPs every second of every day. Nothing to panic about. You don’t need a new big idea every week (although latitude is pretty crazy). You need your past big ideas to work. None of those were brilliant new ideas. You have to support your existing base and add common sense functionality to grow. I think G still has great ideas in them; but they don’t have to roll out great ideas to have a good month for users. Thanks Matt, I have never heard of Om. Searching through his blog I noticed that he has an array of important business information. I would love for you to have a few minutes with him to actually see what he is talking about. Google not having any great ideas??? Come again! Even giants need to sleep sometime. Google has had enough big ideas. I’m sure behind closed doors they are brewing up something amazing that will make its way to the surface eventually. My name got caught in the screenshot so now I have to comment. I didn’t intend to come off as a snarky comment troll. I apologize to Mr. Cutts, Malik, and the rest that contribute thoughtful input to the discussion. The quick FriendFeed comment I made was intended to add some levity to the situation and not as a negative….sometimes me trying to be funny isn’t a good thing. I remember people saying that Google was not a big idea when it tried to give people another option against Yahoo when it was new. How people branded it fast as another company which will eventually be crushed by it. I wonder how many times people during that time said that their innovation in search is not something big or new. I say that ideas, good ones especially, start out small. It usually takes time before an idea can become big. Saying that Google has not come up with big ideas lately is like saying that all the cool ideas they now have will not be big in the future. I think it unwise to come to any conclusion so fast. Looking back I think Google is coming up with a lot of things that are really useful and meaningful. Look at where Google maps is already. Gmail remains to be one of the strongest email clients around and it going offline is a big step forward. Google sites, Google apps, Google Earth and the myriad of innovation Google has is evidence enough that big G will never run out of things to help us make our lives simpler and better. An idea is considered “big” when…? I doubt everyone agrees when an idea is considered “big”, so the statement from OM is very subjective. 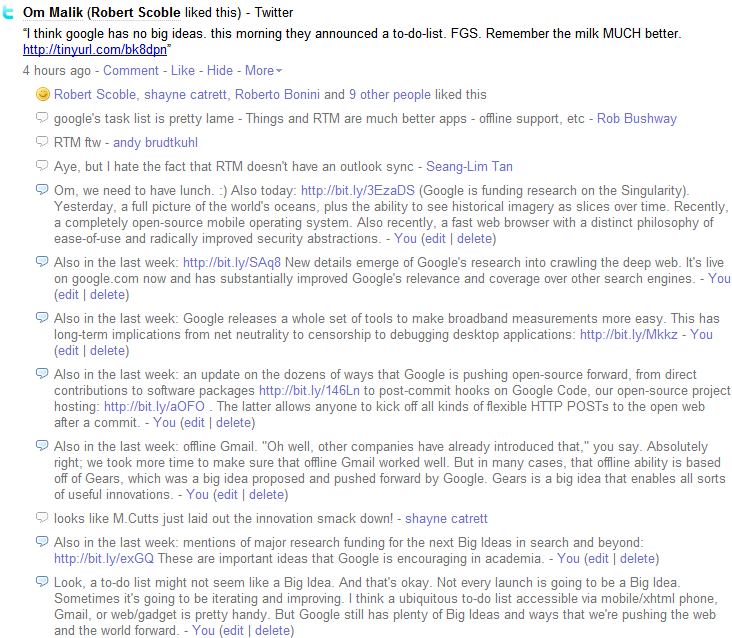 Matt, what a coincidence I just finished reading the news in my Google Reader, Gmail and adding to my Google Task List. I was just thinking was useful application the Google Task List was when read this blog post in my Google desktop aggregator. To add a task you just click the + at the bottom and type in your new task. I find it much easier to copy (ctrl C) from email or whatever and then paste (ctrl V) right on the task list. If you click on a task a carrot (>) will appear at the right side, clicking this will open a new window from which you can enter task due date and other notes about the task. You can reorder them by clicking them and using the ctrl and up or down keys on your keyboard. Of all the task lists I have tried this one is the most useful. I also use the Google Calendar for some tasks if they must be completed on a certain day. I use Google Notes a lot also it is great to keep notes that can accessed from any computer. I think Google has a of great big ideas. Excuse me while I save this to Google Docs. Google has introduced lots of great and breathtaking products in past like google search engine, gmail(lots of good things added later),google adsense, google earth, google maps, picassa, google toolbar, google pagarank and lots of other things. Most of the times google launched successful services and softwares, but sometimes it failed also(gtalk is not so popular, google chrome). Now the thing is that, whenever google launches something, people think that it should be extraordinary like other products. The quality bar is raised by google itself, and people’s expectations are really very high from google. And I think Om malik is from the on of them who wants something new in every google tool or service. During Obama’s press conference an idea came to me. Google could launch a Google Earth feature that allows users to view the “economic status” of any business that subscribes. Government statistical data would be combined with real time business data to steer citizens’ decisions. This should effectively revitalize and improve where it is most needed. User’s main view is a color (red-green) that denotes the desirability to do business. Each criteria group would have a color relevant to its individual index. Google would pay or barter with business’s to allow information access. If successful, Government will create incentives. Google would create a formula to combine data determining main color. Yeah, I’m late to the party. Gmail tasks may not be a “big” idea, but it is an extremely useful one. The more I use it, the more I realize how much I love it. I believe that entering new ground is best achieved by building a foundations on applications that everyone knows and has used for years. As those standard applications get traction then Google should build on them to leverage the ground they have already established. This seems like a good strategy because the foundation of any strategy must be solid before a house is built. I hope Google doesn’t have too many big ideas. I still blame PageRank for destroying the web as we knew it. The best (and biggest) idea I can think of would be to eliminate PR because honestly PR penalties to Google Japan and jtrotta.com don’t actually do anything to improve the web. And Google.com or Yahoo.com having strong PR doesn’t help the web either. But having a bunch of webmasters buying and selling links based on PR creates a total mess that Google wastes millions trying to clean up. Sometimes the simple solution is best – get rid of PR please. Google is executing on a vast scale on several fronts. The last thing it needs is a steady stream of new initiatives. It is hard to imagine there are many ideas that are big compared to what Google is doing now that Google can a) carry out effectively and b) not distract themselves from their already heavy work load. Be thankful for small mercies. Great post Matt! I recently blogged on Google’s Deep Web crawling (http://www.beminteractive.com/blog/2009/02/behind-form-google-and-deep-web-crawl.html) – it’s a really significant jump forward, and I can’t believe it’s not being discussed more! Glad to see it’s getting some exposure. I’m expecting big things from Android as well, especially once mainstream adoption of mobile computing picks up – unfortunately I think it’s kind of stalled due to the current conditions. ← Good books to read?